This post walks you through how to create an OData feed, define a shape for the data and pre-filter the data using Visual Studio 2010, WCF Data Services and the Entity Framework. A sample project is attached at the bottom of Part 2 of this post. 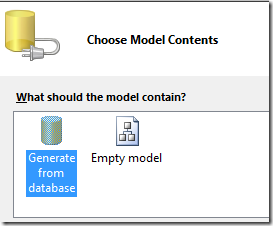 Select “ADO.NET Entity Data Model” under "Data”. Name the Model “Northwind” and click “Add”. Define a connection to your database containing the Northwind database in the next screen. We are going to expose the Products table through our OData feed. Select “Products” in the “Choose your Database Object” screen. Click “Finish”. We are done creating our Entity Data Model. Save the Northwind.edmx file created. 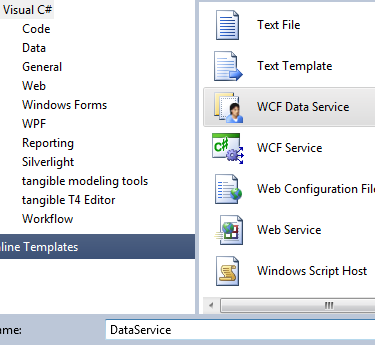 Select “WCF Data Service” from the list and call the service “DataService” (creative, huh?). Click “Add”. Open the DataService.svc.cs class. The class is well commented and instructs us on the next steps. Replace the comment that starts with “/* TODO:” with “NorthwindEntities” (the entity container name of the Model we created earlier). WCF Data Services is initially locked down by default, FTW! No data is exposed without you explicitly setting it. You have explicitly specify which Entity sets you wish to expose and what rights are allowed by using the SetEntitySetAccessRule. The SetServiceOperationAccessRule on the other hand sets rules for a specified operation. Let us define an access rule to expose the Products Entity we created earlier. We use the EnititySetRights.AllRead since we want to give read only access. Our modified code is shown below. We are done setting up our ODataFeed! Compile your project. Right click on DataService.svc and select “View in Browser” to see the OData feed. To view the feed in IE, you must make sure that "Feed Reading View" is turned off. You set this under Tools -› Internet Options -› Content tab. If you navigate to “Products”, you should see the Products feed. Note also that URIs are case sensitive. ie. Products work but products doesn’t. At the time of this writing, supported operations are $orderby, $top, $skip, $filter, $expand, $format†, $select, $inlinecount. The Product feed currently returns all Products. We want to change that so that it contains only Products that have not been discontinued. WCF introduces the concept of interceptors which allows us to inject custom validation/policy logic into the request/response pipeline of a WCF data service. We will use a QueryInterceptor to pre-filter the data so that it returns only Products that are not discontinued. To create a QueryInterceptor, write a method that returns an Expression<Func<T, bool>> and mark it with the QueryInterceptor attribute as shown below. Viewing the feed after compilation will only show products that have not been discontinued. We also confirm this by looking at the WHERE clause in the SQL generated by the entity framework. Other examples of Query/Change interceptors can be seen here including an example to filter data based on the identity of the authenticated user. We are done pre-filtering our data. In the next part of this post, we will see how to shape our data. Hi, this is a great helper as I'm writing an OData service at the moment. However, I'm having trouble filtering with two criteria e.g. Can you supply a small example?